Blueprints are pathways through a year-long Earth Science class. 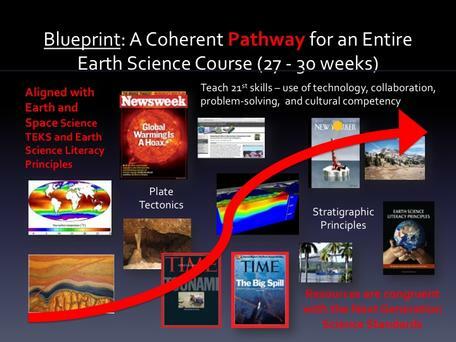 The blueprints are pathways through an entire year-long, capstone level, high school Earth science curriculum. Each blueprint has a theme that stitches together a set of three-week teaching units populated with carefully selected learning activities and other educational resources. Each unit takes about three weeks to implement in the classroom. Scaffolding notes are included to help guide instructors on how to teach the unit. Recognizing the value of field learning in Earth Science, we include ideas for real and virtual field trips. Although developed for Texas teachers by Texas teachers, educators in any state can select units from the DIG Texas collection of 20 live units and arrange them in their own framework to create a customized blueprint that meets the needs of their schools, districts, and unique settings. Note: To open a blueprint in a new tab or window, right click the blueprint link and select the preferred option. To view current live units, individually, in a new tab or window, right click the unit link at the bottom of the page and select the preferred option. Earth is a beautiful world. The intricacies of our planet are the stuff of adventure and inspiration. Units in this blueprint explore earth science themes from large to small scales and evaluate the dynamic nature of earth processes through a systems view. For example, solar flares are large scale elements in earth systems and microbes are some of the tiniest, yet both may have a huge effect on global climate conditions. The blueprint was inspired by the Voyager Golden Records included aboard spacecraft Voyager 1 and Voyager 2, which were launched in 1977 to study Jupiter and Saturn. The mission has since been extended to explore the outermost limit's of the sun's influence and beyond. Voyager 2, which also flew by Uranus and Neptune, is on its way to interstellar space. This blueprint for high school Earth and Space science is designed to serve as a coherent framework for teachers to follow as they teach a one-year course. It is organized on themes in Earth system science that were presented in the NSF-sponsored TeXas Earth and Space Science (TXESS) Revolution teacher professional development program. The blueprint does not attempt to cover all of Earth and Space Science, but rather it takes an in-depth look at some key topics that are critical for understanding the challenges that humans face in living on this "restless planet." In Texas, Earth and Space Science (ESS) is a capstone course designed to build on students' prior scientific and academic knowledge and skills to develop understanding of Earth's system in space and time. The course follows an Earth systems approach to address three themes: (A) Earth in space and time, (B) solid Earth, and (C) fluid Earth. ESS has three strands used throughout each of the three themes: (A) systems, (B) energy, and (C) relevance. These themes and strands underpin the content in this blueprint, which emphasizes that proper stewardship of Earth will prevent unnecessary degradation and destruction of Earth's subsystems and diminish detrimental impacts to individuals and society. This blueprint integrates elements of STEAM — science, technology, engineering, art, and mathematics — into a program that combines field learning with classroom instruction based on the DIG Texas Blueprints units. The approach, developed for UTEP's summer geoscience Upward Bound Geoscience program, includes local geology field trips and a project-based learning activity in which students use geospatial technologies to create Earth Science story maps about their field experiences. Story maps incorporate resources from the Dig Texas Blueprints units in combination with online interactive maps and multimedia content into elegant products in order to tell an Earth Science story. Each student's story map is a unique product comprising their own notes, reflections on the field trip, and charts, graphs, or other products selected from the DIG Texas Blueprints units that served as the basis for their classroom instruction.